The land of Frazzledom is probably familiar territory for the best of us. I know it is for me; there’s always something to do, something you’ve probably forgotten, someone rubbing you up the wrong way and something you’re not good enough at. 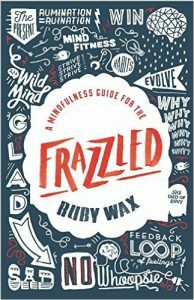 Everyday stresses may be a constant companion, but in this semi-autobiography slash self-help guide, Ruby Wax attempts help us de-frazzle with an introduction to mindful psychology. With a masters degree in mindfulness-based cognitive therapy, Wax certainly knows what she’s talking about. I was impressed by her knowledge of the science behind mindfulness, the interesting tidbits of neurobiology and how our brains have evolved (or entirely failed to). She breaks all this down for us in an accessible way, mixed in with some fun little analogies and honest humour.